In The Maltese Falcon (1941), there's a scene when Sam Spade (Humphrey Bogart) goes to a hotel room to have a talk with Kasper Gutman, aka the fat man (Sydney Greenstreet). During the meeting Spade gets very angry and starts to shout. Then he leaves the room. But when he's out in the hall, he stops for a moment, and laughs. It's apparent that he wasn't angry at all, it was just a game he was playing. This game playing is one of the reasons why I like The Maltese Falcon so much, because in a sense it is a visual statement of one of my central philosophical beliefs. The belief that life is a game, or rather that it is a multitude of games, which we all have to play, and the better the player the better the life. You might call it my own kind of game theory. What you do, how you behave, how you interact with other human beings, how society functions, it's all different games. Life games are not necessarily zero-sum games, so there might be multiple winners. But a combination of luck and skills are essential in order to really prosper. Some might call it cynical, but it needn't be. It is often unfair perhaps, but then life is unfair, and besides, what is fair and what is not is not that straightforward, and too complicated an issue to discuss here. But even if you don't play the game well you will still be able to live a good life, at least tolerable, as long as you've got friends, family and a social safety net. Let us return to the film instead, because one thing that films can do is embody a philosophy, and it doesn't matter whether or not this was consciously done on behalf of the filmmakers. I don't think they were thinking about my ideas when they made The Maltese Falcon but it's still all about the game, and Sam Spade plays it better than anyone else, that's why he's left standing after the 100 minutes of screen time. It's not because he's got a gun, or physical strength, or people to back him up, it's because he knows how to play. Towards the end Sam Spade, Joel Cairo (Peter Lorre), Gutman, Brigid O'Shaughnessy (Mary Astor) and Wilmer (Elisha Cook Jr.) are all more or less trapped in the same apartment, and Gutman threatens to kill Spade. Spade answers that it would be foolish of Gutman to kill him, since Spade knows things Gutman wants to know, so it's an empty threat. Gutman replies that in the heat of the moment people might do foolish things, to which Spade replies "Then the trick from my angle is to make my play strong enough to tie you up, but not make you mad enough to bump me off against your better judgement." This is not exactly the same as the prisoner's dilemma, which is one of the most famous practical models of proper game theory, but it is still a fascinating example of game playing, with the highest of stakes. In the same scene Spade also tries to convince the others that they need a fall guy, somebody to give to the police. Nobody of course wants to be that person, but Spade's reasoning is solid. Someone has to give. It should be remembered that the film is based on the novel by Dashiell Hammett, and he should be given credit for the original ideas and for the dialogue, John Huston (writer and director) has "only" done a very good and faithful interpretation of it, aided by the great performances and Arthur Edeson's photography. It is very much the stuff that dreams are made off. More on proper game theory here and here. A basic explanation is that it is a theory about interactions between agents, and how these interactions decides the outcome, intended or not. It's today used in many disciplines, like economics, physics, biology, sociology and so on. A key factor is equilibrium, in many different shapes, such as Nash equilibrium. The prisoner's dilemma is when two prisoners are both, independently of each other, given a choice by a judge. If they both deny the charges, they will both be given, say, 2 years. If both confess they will both be given 5 years. If one confess and the other denies, the one who confess will go free and the one that denies will get 10 years. How shall they respond? The first film version of The Maltese Falcon came in 1931, but it is much less striking. There's also a version with Bette Davis from 1936 called Satan Met a Lady. Neat title. "Your 'I love' is an impure affair. But to be completely at one with what you love, you need maturity. That means searching. This is the truth of life. That's why love is a solution, on condition that it is true." Some time in the late 1990s I flicked through the two cinema books by Gilles Deleuze, since he had become famous enough to reach my ears. I did however put the books back on their shelf not feeling they were useful for me. Now that I'm in St Andrews I'm reminded of him almost on a daily basis so I might as well write down some thoughts. Although I'm not a Deleuzian we do have some mutual interests. Deleuze's writings are famously opaque, and he (and Felix Guattari) have an annoying tendency to use words that already exist but give them a new meaning, and therefore confuse the reader even more. It is tempting to ask why. Why not come up with a new word instead, or at least use a word closer to the actual meaning they are aiming for. It could of course be part of the philosophical project to re-distribute meaning (becoming-bewildered? ), but it's still annoying. But since this is a film blog I will not critically engage with his politics or philosophy, tempted that I am, but concern myself with some aspects of his writings on cinema. I make no claim to say anything original though. 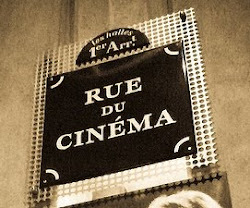 When people try to sum up the ideas of cinema, they usually say that Deleuze divides cinema into two categories, "movement-image" and "time-image", and that before second world war there was only the movement-image. Movement-image means films with a clear cause and effect structure, with time subservient to action and/or space. After the war the time-image came about, which less (or no) causality and where time in itself could become a subject, or at least that scenes or whole films were showing time unaltered, letting time flow at its own pace. Some, in order to simplify, say that movement-image equals mainstream cinema in general and classical Hollywood cinema in particular and time-image equals European art cinema. This is not how Deleuze saw it. Movement-image was not just Hollywood but also for example French impressionism, Soviet montage, German expressionism and the films of Carl Th. Dreyer. This is actually part of what makes him distinguished. This is also one instance where Deleuze's construction of the history of cinema becomes puzzling. He argues that there was a crisis in the movement-image, partly due to the films of Alfred Hitchcock, and that Italian neorealism brought about the birth of the time-image. This was due to the destruction of Italian cities during the war, and also because the idea of the American dream was shattered, and, argues Deleuzian scholar D.N. Rodowick, a lack of trust in democracy. This feels somewhat roundabout and unsatisfactory. If Hitchcock was a cause, wouldn't the time-image have emerged in the US rather than Italy? Also, since Rear Window (1954) is used as a prime example of the crisis in the movement-image it would seem that this crisis came upon after the birth of the time-image, and consequently could not be the cause. About politics, why would the dream of America be shattered? They had just won the war and was arguably at the height of their global status, or does Deleuze mean that the Italians were dreaming of America during the war, and then stopped in the clear light of peace? Since Italy hadn't had democracy for some 25 years (and only partially before that) it does sound strange to say that neorealism came about because of a new lack of trust in democracy. What they lacked was not trust, what they lacked was democracy, which now came about after the war. Might it not be said that neorealism came about because of democracy and the American dream, rather than because of a disentanglement from it? If we return to the neorealist films it doesn't get clearer because what Deleuze describes as the time-image in them is not really there. Take two early neorealist films, Rome Open City (Roma, città aparta 1945) and Shoeshine (Sciuscià 1946). They tell fast, straightforward, conventional stories (movement-image), with Shoeshine in particular similar in style to a lot of Warner Bros. films of the 1930s. That their relationship to time would differ from earlier mainstream cinema is at best dubious. A central neorealist film such as Bicycle Thieves (Ladri di biciclette 1948) also follows a clear, linear storyline, with straightforward cause and effect. It's a slightly melodramatic story using simple cinematic devices to guide to viewer through it, and uses music for emphasis. Man gets a job, man needs bicycle to keep job, bicycle gets stolen, man looks for bicycle with son, man finds thief, thief escapes, man and son becomes estranged from each other, man tries to steal bicycle, man gets caught trying to steal bicycle, man and son re-connect. It is again not clear what is new in relation to time, even though the film is slower and a bit more meandering than a film like Dead End (1937), or Rome, Open City for that matter. I'm not saying that Bicycle Thieves isn't different from a lot of Hollywood films, because it is, but that is not particularly interesting. If it was different from all films that came before, from all countries, then that would be interesting. Alas, I don't see it. At one point Deleuze says about the crisis in the movement-image that: "[t]hese are the five characteristics of the new image: the dispersive situation, the deliberately weak links, the voyage form, the consciousness of clichés, the condemnation of the plot." and then he adds that "It was Italian neo-realism which forged the five preceding characteristics." But that is actually a pretty definitive description of Hitchcock's The 39 Steps (1935), with the exception of the dispersive situation, rather than neorealism. Besides, some films made in classical Hollywood, such as Portrait of Jennie (1948), have a much more radical relationship to time than most, if not all, neorealist films. One of Deleuze's favourite examples of the time-image is Last Year in Marienbad (L'année dernière à Marienbad 1961) and here the differences between it and classical cinema are clear. There is no question about it having a totally different relationship to time, space and causality then, say His Girl Friday (1940). But again, what exactly is the significance of this fact? Can we say something about society in general based on this difference, or about cinema? The Bicycle Thieves and Last Year in Marienbad are also equally different from each other. If Bicycle Thieves is time-image, it would be tempting to describe Last Year in Marienbad as anti-time-image, since it almost obliterates time. It has so completely broken down the concepts of past, present and future that it might be said to take place out of time. Deleuze also suggests that this new cinema of the time-image consists of "seers", people who do not act or react but just observe. This to is debatable. In the neorealist films mentioned above the characters are active, both taking charge and/or reacting constructively (more or less) to what is happening. Deleuze also uses as an example the boy in Germany Year Zero (Germania anno zero 1948). While it is true that the boy walks around a lot, just watching, he finally acts upon that which he has seen, killing first his father and then himself, and this has been clearly signalled all the way from the first scene (where two women talk about suicide), and enhanced by the dramatic music. In a sense he's not that different from many a hapless detective in film noir, or Ole in The Killers (1946). Besides, don't films in general often have a combination of "seers" and doers"? Like The Searchers (1956), where Ethan Edwards is an active agent, a "doer" and Martin Pawley a "seer", who also reports back, in letters to his adoptive family, what he has seen. In The Little Foxes (1941), Birdie is very much a "seer", or perhaps more correctly a "listener", whereas Regina Giddens is not (how could she be, when played by Bette Davis). So it is in no way clear why neorealism would be a break with the past and an introduction of a time-image whereas all else before would be movement-image. Deleuze is not that dogmatic though, since Citizen Kane (1941) for him is time-image, despite being made in the US before they even entered the war. In general, Deleuze is a bit more flexible than his own writing suggests (and the way he's often interpreted). He does for example discuss the films of Vincente Minnelli as if they were time-image, despite him working in the US and having begun before the neorealists. And he discusses the films of Yasujiro Ozu as being time-image, even before the war. But maybe it is actually a mistake to divide films into either movement-image or time-image. Deleuze divides movement-image into three sub-categories, one of which is affection-image, which is the close-up. Should we take this to mean that there are no close-ups in the time-image? In that case few films are time-image. But if time-images are about time, then having close-ups shouldn't matter. Of these three sub-categories Rodowick says that "every film combines these three sorts of images." This then would mean that all films are movement-image? On the other hand Deleuze says that the time-image was inherent in the movement-image from the beginning, occasionally peeking through but that "it could only realize that it had it in the course of its evolution, thanks to a crisis in the movement-image". Deleuze at one point says that the time-image has become the "soul of cinema", whereas now only the mainstream, commercial films are movement-image. To speak of the "soul of cinema" is rather esoteric and unhelpful in the extreme, and besides, it would appear that most films still is movement-image. Maybe movement-image, since it dominated completely for the first 50 years and still continues to dominate is the true "soul of cinema". But of course neither image is the soul of anything. Is it not possible that there never was a shift from movement-image to time-image but that different movements and different filmmakers, all over the world and all through film history, have had different ways of dealing with time and space, either out of social context, stylistic clichés or personal sensibilities? That there was always both the time-image and the movement-image, side by side, sometimes in the same film. Could you not say for example that in Don Siegel's best films movement-image and time-image merge. Or perhaps it would be easier to get rid of these confusing and contradictory terms all together. But I still want to rescue one half of the idea of time-image, because there is something worthwhile in that concept. Not when it refers to Last Year in Marienbad but when it refers to the breaks in the narrative flow that Deleuze writes about. One example of a time-image sequence that he mentions, inspired by André Bazin, is the pregnant maid, alone in the kitchen, in Umberto D. (1952). It has been used by so many others for explaining the time-image that I'm sometimes tempted to ask if it is the only example. But that would be unfair because films are full of those scenes, and besides it is a lovely scene (although it is still embedded in the story, linked casually to what happened before). You can find them all the way from the beginnings of narrative feature film in the mid-1910s, scenes when the story, the narrative, stands still, takes a step back, just observes time, or the movement of bodies in unaltered time and space. They are plentiful in the films of John Ford, one of the foremost of "time-artists", in the films of Japanese directors such as Yasujiro Ozu, Mikio Naruse, Sadao Yamanaka, in films of Frank Borzage, Ernst Lubitsch, Howard Hawks, Leo McCarey, Powell and Pressburger and Jean Renoir, to name some obvious examples from pre-second world war cinema. Possibly George Cukor as well. But these sequences don't need Deleuze to be acknowledged, in fact arguably Deleuze forgets about them in his eagerness to give a post-war birth to this time-image. There are many terms, concepts and ideas in Deleuze's cinema books that I haven't mentioned, and I won't either, not this time. There are aspects of the "crystal-image" which I like, but I would use it in a different way from how he does it, and I might come back to that. Now I will just say that even though the cinema books might be useful for the study of the philosophy of Deleuze, or philosophies on time, it becomes a problem when he tries to force his theories about time and life in general on to the films, and his analysis and historical perspective suffers as a result. Deleuze could of course easily argue that I'm wrong in all that I'm saying because, on a certain level, he invented these images. He decided that (almost) all films prior to 1945 were this movement-image. Then he decided that there was a crisis in this movement-image that he had invented, and then he came up with the time-image. Who am I to argue with this, these were his concepts and he should be allowed to use it as he sees fit. Since he has only explained the rules of his images in opaque terms, he has given himself some wiggle room. I would also like to suggest that the cinema of Borzage is the love-image. The quotes from D.N. Rodowick are from Gilles Deleuze's Time Machine. The quotes from Deleuze are from Cinema 2: The Time-Image. You would have thought perhaps that in this day and age, the prejudices against "classical" Hollywood cinema would have been abolished, and that empty dichotomies between, say, Hollywood cinema and European cinema, or "old school" Hollywood and "modern" cinema or whatever, were no longer used with a straight face. But that's not the case, and persistent perceptions still lingers on. To these conservative mindsets, one appropriate question to raise is "So, what about Preminger?" A common response is "Preminger who?" Because of course, this condescending attitude to "classical" or "old school" Hollywood doesn't usually come from over-exposure but rather under-exposure to it. At the end of Godard's Breathless (A bout de souffle 1960), much have been made of the fact that Jean Seberg looks directly into the camera, about the violation of the rule of not breaking the fourth wall, of Godard's audacity. But is it not possible that a reason why Godard had Seberg look directly at the camera, facing the audience, was that he wanted to pay homage to his hero Preminger. In the film Preminger made two years earlier with Seberg in Hollywood, Bonjour Tristesse (1958), he had her look into the camera, into the eyes of the spectators. Why is the one celebrated and not the other? But these things doesn't really matter, and Preminger was of course not the only filmmaker working in the US that was far removed from the clichés of what Hollywood cinema was, is, should be. What matters here are the films, and the man who made them. Preminger was a public figure, he nursed a public persona, and he was intimately involved in his films, them being the extension of his persona in a sense. Like Lubitsch before him, and like Hitchcock, he would appear in the trailers for his films, making sure that people knew that these were his films. And in the films, the way his presence is felt is through the camera, the way it moves and the length with which it operates unmolested by a cut. The longer a shot continues, the stronger Preminger's presence is felt. People enters and leaves the frames, conversations have begun before the characters arrive in the shot, or continues after they've left, or a conversation takes place in the middle of the shot, the beginning and end being silent, or about something else, and yet perhaps being the most important part of the shot. Can films do philosophy it is sometimes asked. They can, and Preminger is one of cinema's philosopher. At the centre of his philosophy is the argument, sustained from film after film at least from Laura (1944), that the world is filled of doubt and compromise. Some would say he was a cynic, other that he was a realist. He was possibly neither, just a cold observer of the world around us. What makes Preminger such a great filmmaker, one of the best, is the way his camera becomes the tool with which he writes his philosophical tracts. It is partly his refusal to cut, to change the point of view, or, rather, the refusal to give anybody but him a preferred point of view, that makes his cinema so rich, so rewarding and so unsettling. It is typical, as well as bold to the point of arrogance, that after having let the audience spend almost two and a half hour in a courtroom (in Anatomy of a Murder 1959), Preminger doesn't tell us who is guilty and who his innocent, or what actually happened. He cannot tell us because he wasn't there at the scene of the crime and when the film ends we're none the wiser. Doubt prevails. In what is perhaps his last masterpiece, Bunny Lake is Missing (1965), we spend almost the entire film wondering what is happening. Is this a film about a crazy woman, protected by her husband, or is it her brother? Or is it a sane woman misunderstood and not trusted by the authorities? Or is it possible that she is both crazy and misunderstood? And what will happen after "the end"? Preminger's choice of subject matters is also part of his philosophy. After the early great thrillers in the 40s with Dana Andrews and/or Gene Tierney, about compromised and flawed characters, Preminger in the 50s became independent and began to tackle even bigger subjects such as war, politics, law, religion, history, racism and statecraft, always with the same opaque style, the camera letting everybody have their say, but always making us feel that we're not being told everything, that the puzzle is incomplete. And that this is the state of things, this is the way of the world. Everybody has his or her agenda, and what that agenda is, and whether it'll work, remains in doubt. But in order to proceed we need to compromise. The world is an imperfect place, and it is this because we humans are imperfect. The most unsettling fact of Advise and Consent (1962) is that although Congress and its members are doing stupid and/or disturbing things, there's nobody really to blame. They've all got their reasons, and they're neither necessarily evil or corrupt, it's just that they are human and therefore flawed. Guilt, jealousy, pride, principles, even kindness, it all has the potential to trip people up, or be used against them. This, also, is part of Preminger's philosophy. Preminger often seemed to be in a league of his own, but he was of course a part of the system as much as anybody. But he wasn't content with keeping it stable, instead constantly bending the rules, pushing things further, both in terms of subject matter or style. Not always successfully, but often enough. Clothes in films can be fascinating, and immensely important. Think of Julie Marsden (Bette Davis) going to a ball in Jezebel (1938), dressed in red when everybody else are dressed in white, as society demands. Or think of the films of Wes Anderson. A couple of years ago I wrote about films, clothes and fashion on my Swedish film blog, and I've been meaning to do the same here, in English. Earlier this week Girish Shambu wrote a post on his blog about clothes in films, and was kind enough to encourage me to translate my original piece, so I've done that. Before I get on with the old text though I'd like to set the tone by a quote from one of Cecil B. DeMille's great, early films, Don't Change Your Husband (1919): "Of those external forces which combine to make us what we are, DRESS is the most potent. It covers our ideas no less than our bodies - until we finally become the thing we look to be." To this might be added that clothes are often used to explain and/or underline a character's position, or state of mind. A favourite example is from The Ghost and the Darkness (1996), an adventure film set in 1898. In the first scene colonel Patterson (Val Kilmer) is dressed in a new, shiny, immaculate uniform, in the last he is dressed in torn, dirty clothes. That pretty much sums up the film, of how a man is changed, transformed, degraded by leaving home, and England, and getting immersed in colonial warfare. Could the clothes perhaps been seen as an allegory for how Britain also became transformed and degraded by its colonial adventures? When Clark Cable took of his clothes in a scene in It Happened One Night (1934) United States was in shock, and possibly the rest of the world as well. Not so much because he took of his clothes but for the fact that he wasn't wearing a vest or undershirt beneath his shirt, it was only his naked torso, which went against the conventions. As a result of this the sale of vests decreased rapidly, since men didn't want to walk around with such a garment when the great Gable didn't. And truth be told, when I saw the film for the first time I was surprised as well. This is but one of many examples of how film and fashion are intimately connected, and proof that it isn't a new phenomenon. Jennifer Aniston is famous for her hairstyles [it least she was when I wrote it], which have been eagerly copied, but she's just one in a long line of others. During the second world war it was the hairdo of Veronica Lake that ruled. It was called peekaboo and consisted of long, flowing hair that covered half the face, something which would cause unexpected problems. Due to the war many women were suddenly working outside of the homes and many were operating machinery. There it was not practical to have the same kind of hairstyle as Lake and after several accidents where women's hair got caught in the machines, the authorities urged Lake to change her hairstyle, which she did (her own contribution to the war effort). But to get back to clothes. Annie Hall (1977) is famous for being Woody Allen's breakthrough as a serious filmmaker, but it was also the film with which Diane Keaton created a new fashion. The clothes she wear in the film, designed by Ruth Morley and Ralph Lauren, and inspired by Katherine Hepburn's style, was a slightly bohemian mixture of hats, ties, pants and vests, and this suddenly became very trendy. Seen in a broader perspective perhaps Annie Hall's clothes have been more influential than Annie Hall itself. In any event a new fashion was created, just as khaki became fashionable after the release of Out of Africa (1985) and fur hats became fashionable after the release of Doctor Zjivago (1965). Brokeback Mountain (2005) naturally boosted sales of cowboy outfits, and Marie Antoinette (2006) is yet another example of how a film can (re-)create a fashion. Edith Head and Hubert de Givenchy's clothes for Audrey Hepburn in the excessively chic Breakfast at Tiffany's (1961) are even more important. It's one of the most influential films ever made when it comes to fashion, not least for its long, black sheath dresses. Sometimes it is easier to understand a film if you know what the dress codes are (or were) when the film was made, what was fashionable when, and where, the film was made. The way a person dress signals his/her status and position and in a modern film that might be easy to read, but in older films or films from cultures different from our own it becomes more difficult, but it is still something to pay attention to. When Irene Dunne's character in My Favourite Wife (1940) comes back to civilisation after having been on a deserted island for several years, one recurring motif is that her dresses are hopelessly unfashionable. This was of course obvious for the female viewers at the time, but that dimension gets lost if you're not knowledgeable about 1940s fashion. And because clothes and décor are important good filmmakers don't t leave these things to chance. Alfred Hitchcock, to name an obvious example, took everything into consideration, down to the colour of the shoes, and in several of his films the clothes have a symbolic and/or psychological importance, such as on Madeleine/Judy (Kim Novak) in Vertigo (1958). In another of Hitchcock's films from the 1950s, To Catch a Thief (1955), it's Grace Kelly that plays the lead and her clothes, created by Edith Head, are among the most spectacular you are likely to see. (I once met a woman who were disappointed that she only had it on VHS, with mandatory subtitles, because the subtitles hid the shoes that Kelly was wearing.) And they tell a lot about her character's personality, self-sufficient and bold, and perhaps with something to hide, since she often looks overdressed, like for a costume ball. These clothes are perhaps not something you would wear on an ordinary day, but clothes can be important even if they're ordinary. Take as an example the clothes Laura Hunt (Gene Tierney) wears in Laura (1944). They are designed by Bonnie Cashin, and her classy, timeless, office outfits are among the many factors contributing to the brilliance of the film. They say something about who Laura Hunt is, and perhaps even more what kind of person she wants to be. They also say something about women's new role in society in the 1940s. These are some of the reasons why clothing and fashion should be relevant not just for fashionistas, but for academic scholars as well, and why it should be taught at film studies courses. Clothes are not just superficial, clothes are part of a film's signs, telling details, and only the person who can read all the signs will get a complete understanding of the film. Almost all examples were from American films but that isn't because clothes are less important in the films of other countries. It's just expediency on my part that has kept the focus so narrow. But I should at least mention Coco Chanel's clothes for The Rules of the Game (La règle du jeu 1939).